Imagine the easiest-to-play game ever. What does it look like? To me, XeoPlay’s iPhone and iPod touch game TiltWorld is that game. It lives up to its name: all you do to play the game is tilt your device to change your perspective so that the screen is either vertical or horizontal. What makes it especially interesting is that the game is more than entertaining: with every successful puzzle you complete in a level, you actually help re-forest a part of Madagascar. Yes, with real trees! I spoke to game designer and creator Nicole Lazzaro at Macworld | iWorld 2013 in San Francisco, CA about TiltWorld, the future of gaming for social good, and what else XeoPlay has in store for us in the future. Why create a “game for social good,” instead of trying to make big bucks the way other iOS game creators have with such hits as Angry Birds (Rovio), Clash of Clans (Supercell), and Temple Run (Imangi Studios, LLC)? It’s a matter of “doing work that needs doing,” Lazzaro explains, and trying to “unlock the human potential.” TiltWorld aims to do just that, by focusing on an external need–saving our dwindling natural environment from things like pollution and deforestation. 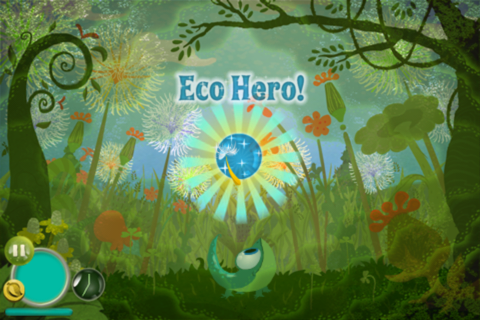 Players are rewarded with coins that translate into actual reforestation efforts via WeForest.org. TiltWorld is an engaging, simple, and fun game that features Flip, a mutated tadpole that rises to save his part of the forest, known as Shady Glen, from pollution and other hazards. By tilting the screen, Flip “flips” and swallows carbon falling from the sky, catches mushrooms to plant in devastated areas, and avoids slime-covered “blights” that damage the forest. The challenge is in flipping to catch what you want in time before it reaches the bottom of the screen, and avoiding the “blights” that harm Flip and his home. But beyond timing and an easy strategy, the game actually feature puzzles in each of its 15 levels, with additional ones added via in-app purchases that unlock new areas of Shady Glen for Flip to save. TiltWorld had its origins all the way back in 2007, back when Lazzaro partnered with Joe Hewitt at the iPhoneDevCamp, when the phone itself was new. Lazzaro and Hewitt walked away with the “Best Game” award from the camp, along with the prestige that comes with developing the first-ever accelerometer-based game for the iPhone. Back then, then game was just Tilt, and was even simpler, involving matching blue and green colors in different directions. Lazzaro’s motivation for the creation of what is now TiltWorld was to expand on the idea she and Hewitt developed, and this time, include a story. Making money is nice, of course, but changing the world and having fun at the same time? A win-win situation. The app, normally 99¢, is free through the end of Macworld on February 2. 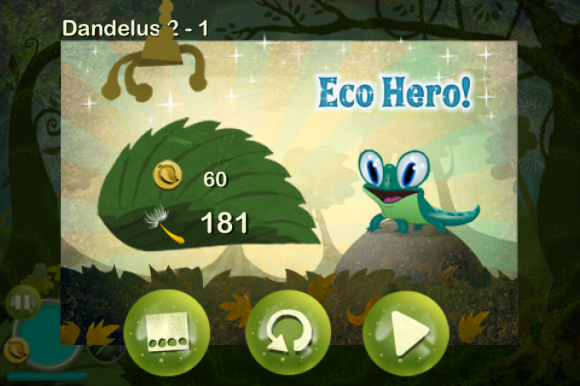 In-app purchases of the new adventures, in addition to regular play of the game, all contribute to reforestation efforts. The game will eventually be available for the iPad; an older version of the game already exists for it, but will be getting a makeover to include the new elements in the iPhone/iPod touch version. It will also be available for Android devices, both phones and tablets, in the Google Play store soon, though Lazzaro did not have an estimated date at press time. Lazzaro also teased an Earth Day mystery to be revealed on the holiday, April 22, 2013. She remained close-lipped about what the surprise could be, but did share some artsy, surreal-looking concept art for XeoPlay’s next endeavor, again focusing on change, but this time, internal rather than external. The mysterious next app will also be a game, so stay tuned as we here at Gaming Dead learn about this and other news from XeoPlay!